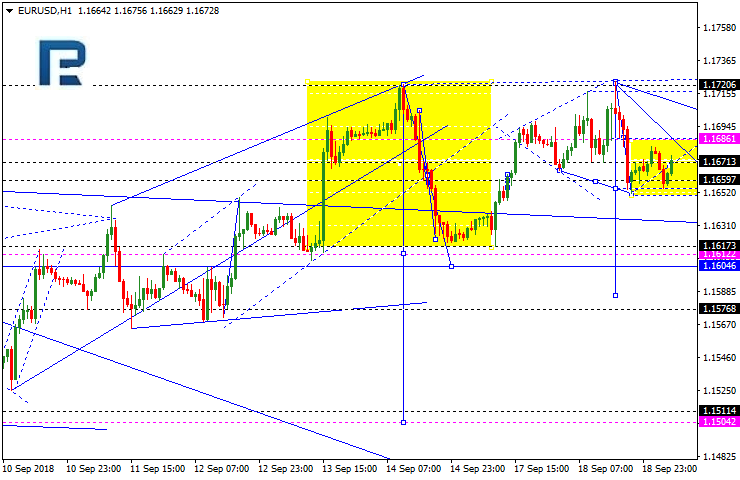 The EURUSD got inside the first downward impulse, and is now correcting. The pair may rise to 1.1686, and then go down to reach 1.1616, i.e. its local target. 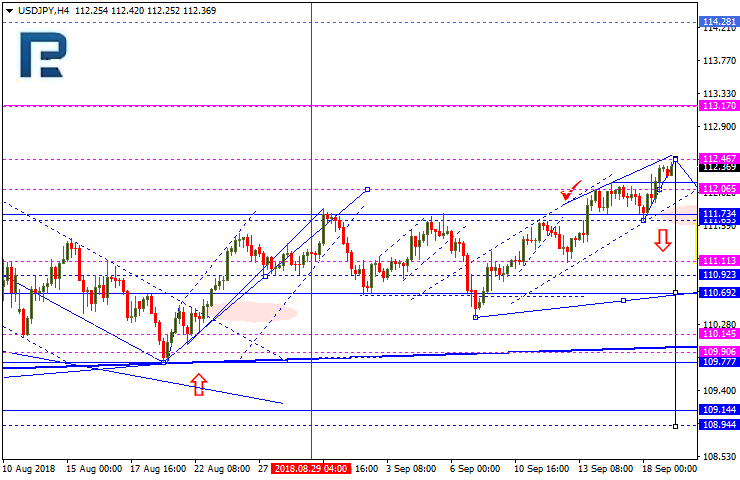 The GBPJPY is consolidating after going up. 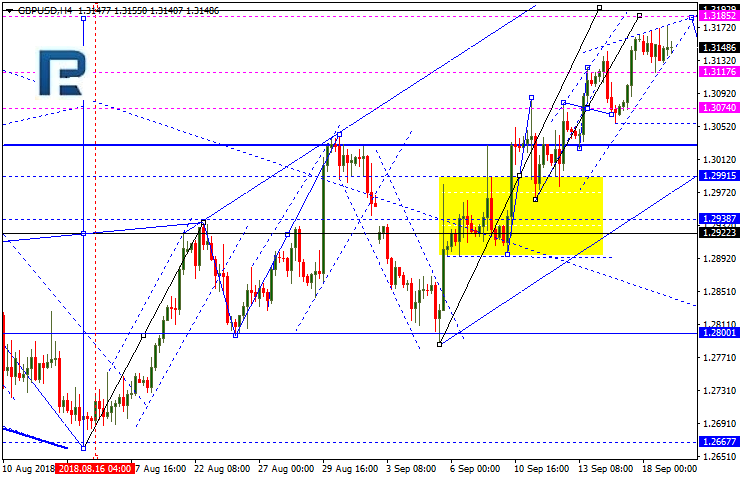 The pair may reach 1.3185, then fall till 1.3074, and finally rise, reaching 1.3111. Upon each of these levels, a new consolidation or reversal range may form. Meanwhile, in case the lower boundary gets broken out, the price may fall down to reach 1.2922. The USDCHF went up and is now correcting. 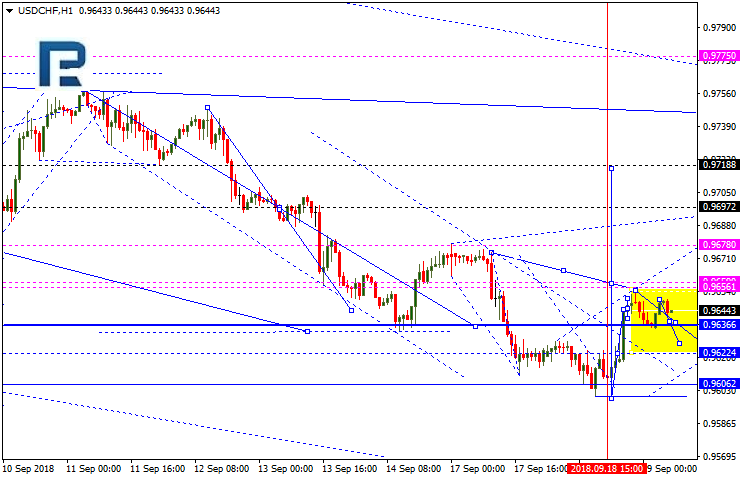 This may lead to a fall towards 0.9622, and then the uptrend is likely to continue, with a local target at 0.9696. 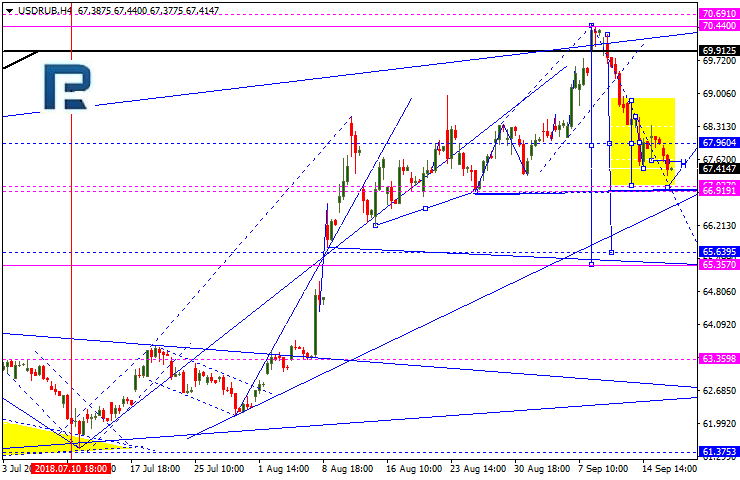 The pair is being pushed upwards and may reach 112.46, but then fall till 111.65, and finally rise, reaching 112.06. Upon each of these levels, a new consolidation or reversal range may form. Meanwhile, in case the lower boundary gets broken out, the price may continue its downtrend to reach 110.65. 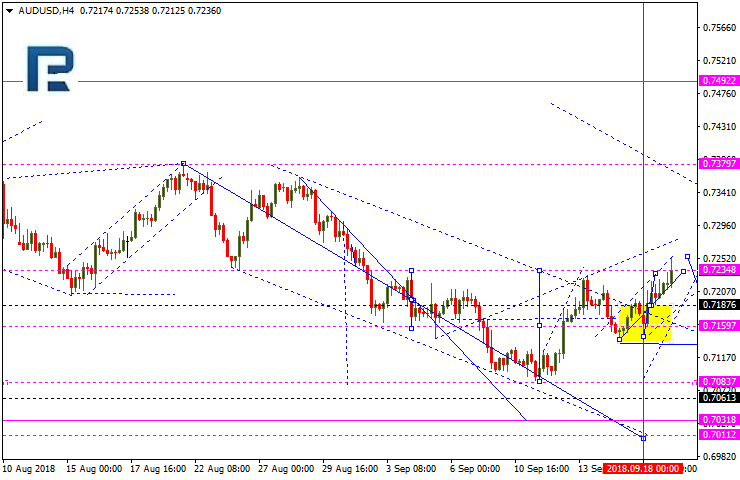 The AUD/USD was able to head upwards, but today it is likely to fall to 0.7130, although then it might rise to 0.7187. Upon these levels, a consolidation range with a reversal pattern may form. Conversely, once the lower boundary gets broken out, the price may head down towards 0.7085, i.e. a local target. 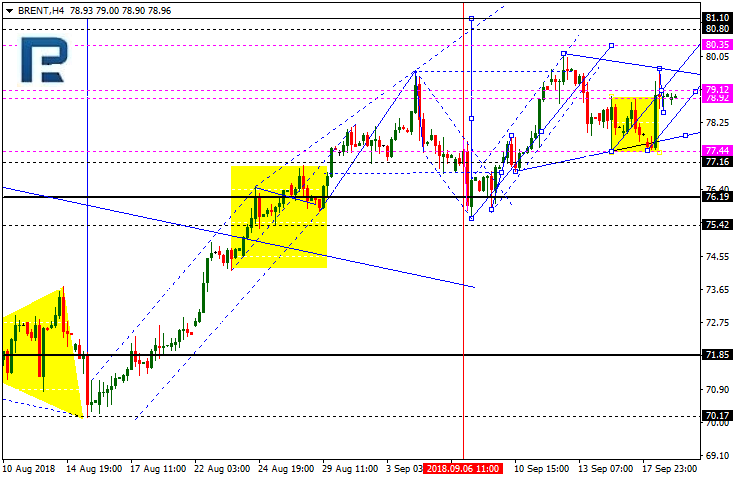 The pair is being pushed upwards, with the target at 67.00, although then it might rise to 67.96. After that, it may go back to 65.65 again, i.e. a local target. The first part of the downward wave is over, and the gold is now correcting, forming a consolidation triangle-like range. 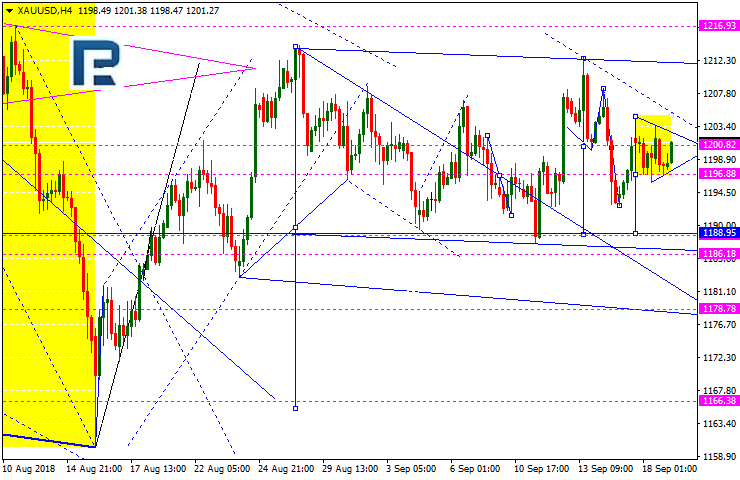 Today, gold is likely to fall to 1188.90, although then it might rise to 1200.80. After that, it may go back to 1178.78 again. Brent crude is trying to break out the upper consolidation range boundary. Today, the crude price may reach 80.50, then fall till 79.20, and then the trend might continue, with the price going to 82.00.